Off to the airport for flights to Toronto and Wordstock. Will watch the Bluejays play tonight with good friend Bryan Cantley. I don’t know many people who have helped as many journalists as Bryan Cantley. Few have helped me as much. Bryan died yesterday of pancreatic cancer. He was a gentleman and a friend and he gave me extraordinary opportunities that boosted my journalism training business. I first met Bryan in 2002. I was fairly new to the business of journalism training and I think I sent a pitch for my workshops to the Canadian Newspaper Association. I can’t recall whether I even had his name or sent it blindly to the group’s executive director, but somehow it ended up with the right guy. I had just done some training for the Cariboo Press newspapers in British Columbia, and was interested in doing more work in Canada. Nick Russell, a leading Canadian voice in journalism ethics, was another speaker at the Cariboo conference and he put in a good word to me with Bryan. Before long, Bryan invited me to train editors and reporters at a workshop of the Canadian Association of Newspaper Editors in Lethbridge, Alberta, in the fall of 2002. And he helped me arrange some more workshops on the same trip at the Calgary Herald. We quickly became friends over dinner and enjoyed many more dinners and drinks across Canada, and a few games of his beloved Toronto Blue Jays. Bryan wore multiple hats, planning programs such as training and awards for four different journalism organizations: CNA (now Newspapers Canada), CANE, the Ryerson Journalism Alumni Association and the Commonwealth Journalists Association. Over the next six years, Bryan invited me to speak at a dozen or so conferences for three of those groups, all but the CJA. I visited Lethbridge, Halifax, Toronto, Winnipeg and Saskatoon for events that Bryan organized. I was an annual speaker — and once the keynote speaker — for five years at the Wordstock writing workshop he organized for the Ryerson alumni. The contacts from those conferences led to lots of other business for me across Canada. Everywhere I went, I met friends of Bryan who were as fond of him as I was. Mimi accompanied me on several of those trips and we dined several times as couples with Bryan and his wife. Eleanor showed Mimi around Toronto and they toured together in Halifax. At the Canadian Newspaper Association conference in 2007, when Bryan was approaching retirement, his colleagues and friends in the business roasted and saluted him in a fond farewell. I enjoyed getting to see that my affection and admiration for Bryan was shared throughout Canadian journalism. But Bryan’s retirement wasn’t really a farewell. He organized another Wordstock or two. He continued helping the CJA. On my last visit to Toronto in 2011 (at another organization’s invitation following Bryan’s semi-retirement), Mimi and I dined again with Bryan and Eleanor (the last time I saw him). He was planning a CJA program in Malta for 2012 and fretting over the details (Bryan knew that details made for a successful conference and he was a master at running a smooth and fun event). Bryan also kept running the National Newspaper Awards program, Canada’s equivalent of the Pulitzer Prizes. He was honored last week with the Michener-Baxter Award for his special contribution to Canadian journalism. In one of our last email exchanges, Bryan told of visiting Hawaii with Eleanor last November, when friends and family of my nephew, Brandon Buttry, honored his memory with a cheeseburger salute the day he was supposed to return from Afghanistan (Brandon was killed in action last year). 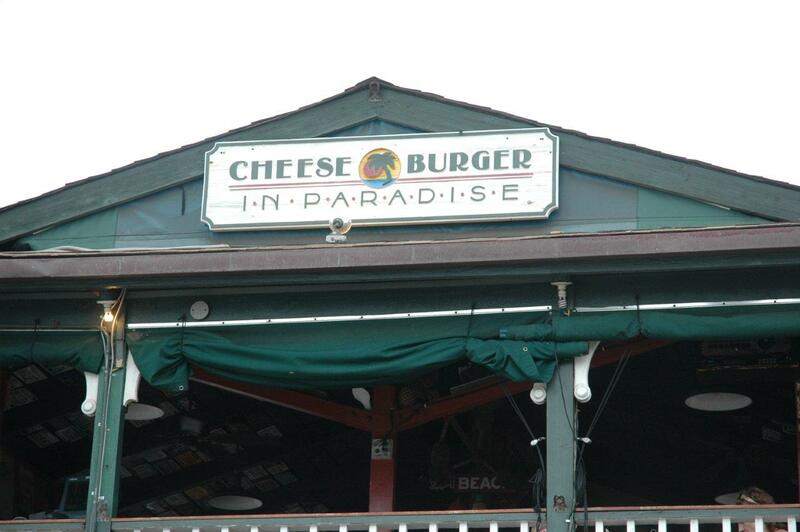 Bryan never met Brandon, but he and Eleanor joined the salute from the original Cheeseburger in Paradise on Maui and sent me a photo. I’m glad Bryan and Eleanor had that vacation in paradise in his last year. I’m glad he helped me so often and so generously. I’m sad that we’ve lost him, but I’ve smiled a lot since learning the sad news yesterday, fondly remembering one of my favorite people in journalism. Thank you for this post. Bryan was a true leader in this industry and had a unique position of respect given he wasn’t an active journalist or an active journalism academic. He will truly be missed. People in journalism across this country today are saying they lost a great friend. Thanks, Peter! Journalists in a lot of countries lost a great friend, but especially in Canada. Wordstock was one of my favorite events anywhere, and that was all due to Bryan’s planning and hard work. I missed the last couple, but went to five of them, I think. Always fun and thought-provoking. I’ll be at Camden Yards for a Yankees-Orioles game Friday. Would be more fitting if I were watching the Jays, but I’ll drink a beer in Bryan’s honor. We will not be stopping at one toast to a very special person we will really miss! I had the pleasure of working with Bryan on several projects, including a couple of stints at Wordstock. I only knew him professionally but when I was laid off in the SunMedia purge, I received a personal note and an offer of assistance from him. He did the same for others. Bryan was one of the few people I have met who was truly a gentleman in every sense of the word. A great loss. So sad. So very sorry to hear this. Bryan was a true gentleman and his quiet manner could not hide a very keen journalistic mind. I worked with him on a number of projects related to new media and computer graphics in the late 1980s and ’90s. He was a joy to work with and had a true knack of getting the best out of the people around him. I have fond memories of accompanying him in pre- and post-game refreshments when the Rangers visited Montreal. My only regret is that we never got around to the golf game he was always threatening. I think he would have let me win. My deepest sympathies to Eleanor.